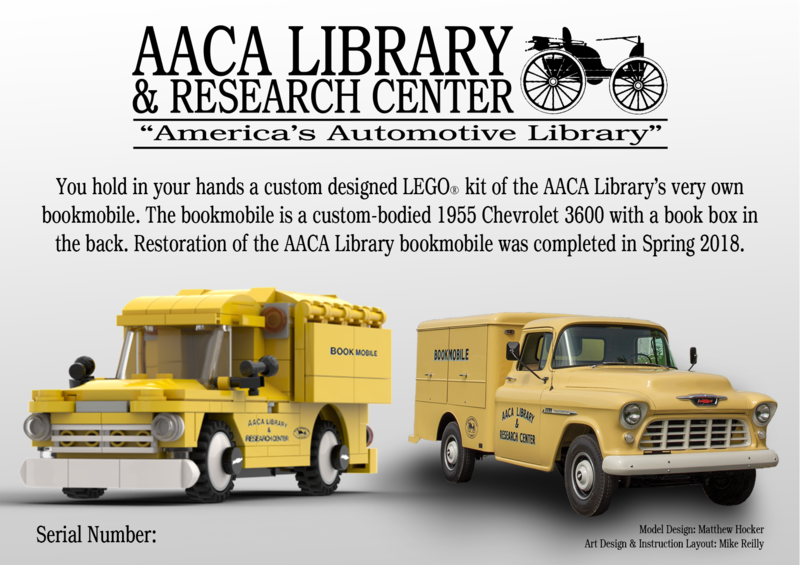 If you love the AACA Library’s 1955 Chevrolet Bookmobile, now’s your chance to hold one in the palm of your hands. The Build-A-Bookmobile is a custom model using genuine LEGO® pieces. 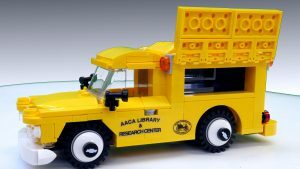 Model includes functional book box doors, a removable top for the cab to seat a driver, and optional build mods with included parts. It measures 6″ x 2.5″ x 2.5″ when completed. 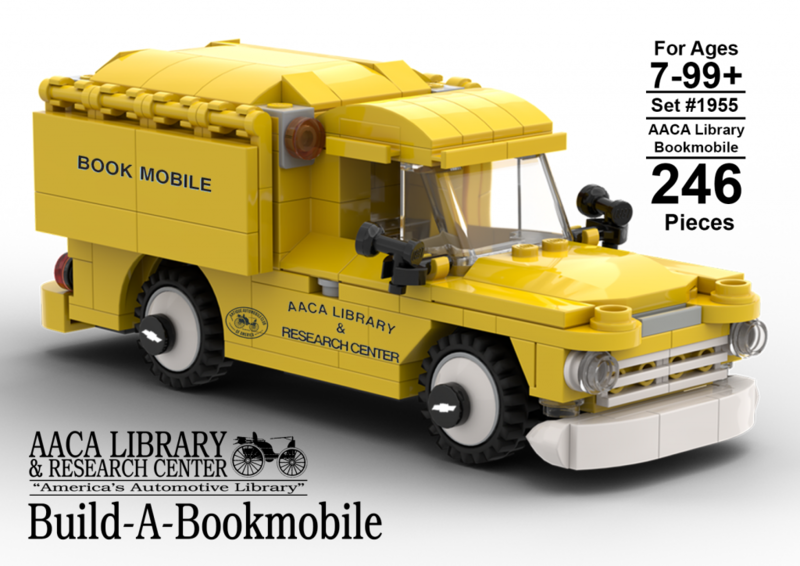 You can even order it with your favorite librarians as minifigures. This is a signed and numbered limited release of 55 units, 20 of which can be bought with the minifigures. This product comes complete with professionally printed and designed building instructions, box art, and decals. Don’t Delay! With limited production numbers you won’t want to miss this deal. This model represents a homegrown effort. The finished build was designed by our Assistant Librarian and lifetime LEGO® fan, Matthew Hocker. Catalog Librarian, Mike Reilly, designed the box art and instruction booklet. Library Director, Chris Ritter, said “make it happen” and here we are today! 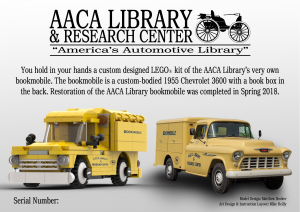 We sincerely thank you for purchasing the AACA Library’s “Build-a-Bookmobile” custom LEGO® kit. 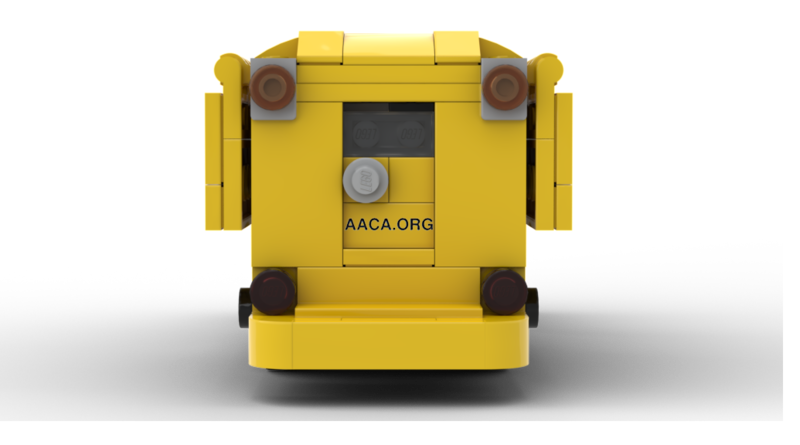 This custom LEGO® kit consists of 100% genuine new and/or used LEGO® elements. 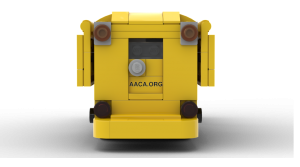 It is neither produced by nor associated with the LEGO® Group. 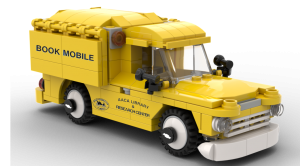 Posted in News and tagged bookmobile, lego on November 23, 2018 by Mike Reilly.